We're still savoring the specials all around the store, too! Here's a taste: 30-50% off Brooks England, Green Dot Specials priced at 25-50% off, closeout Lazer helmets, and more. Yum. Purchase any bike up to $499 and we'll give you a $10 credit! Purchase any bike from $499-$750 and we'll give you a $25 credit! Purchase any bike from $751-$1000 and we'll give you a $50 credit! Purchase any bike from $1001-$1500 and we'll give you a $75 credit! Purchase any bike from $1501-$2000 and we'll give you a $100 credit! Purchase any bike from $2001-$3000 and we'll give you a $150 credit! Purchase any bike for $3001 or more and we'll give you a $200 credit! 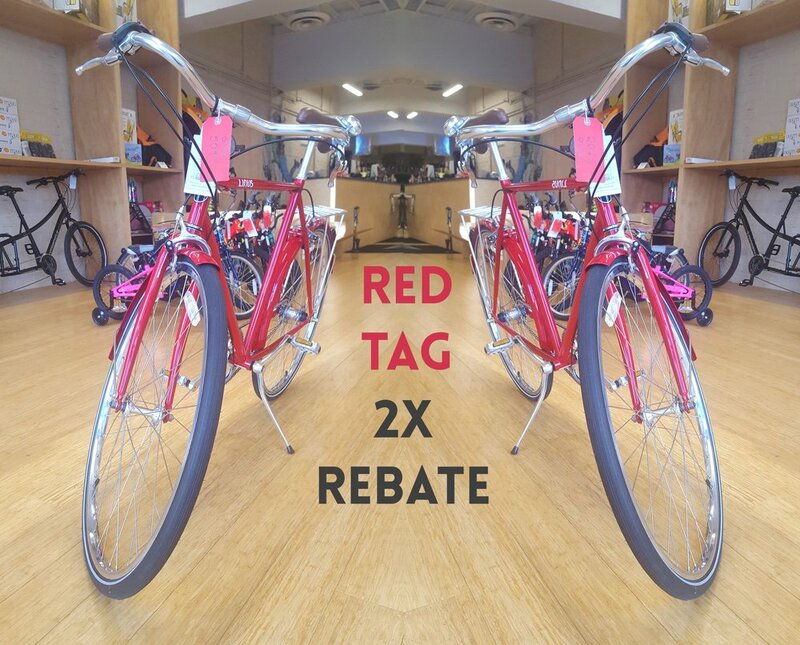 Pick a red tag bike to double your rebate and watch your savings stack up! PLUS! Dreaming about an electric cargo bike? Make those dreams come true with $1000 off Xtracycle ebikes! Check out their selection here: http://www.xtracycle.com/sale/ Please note: sale Xtracycle pricing does not include our shipping/building/extended service warranty, which will add $400 to these bikes. Still a great deal, especially since they'll come with a rebate too! These deals won't last long. So savor the season with us, stop by today and save! Older PostFall can't stop our Savor the Summer Sale!